Homeowner wanted a new gate for the sidewalk leading to her garden. The materials were redwood with new gate hardware. $400 for the gate, $100 for the install. Got the same project in Beverly Hills, CA. Homeowner wants a nice gate. Redwood. 8 planks, Material & Labor, remove old gate, install new gate, Old gate disposal fee included. No Stain, No finish, that’s extra. Potential total $625. Gate building will run about 375.00 to 600.00 depending on fence details and hardware. Here in Fort Worth . need to install a 4ft high 150ft length wire fence for small dog .using a heavy gauge turkey like wire and putting 2o or so fence post in. need to now fair cost not low and not high, middle of the road. 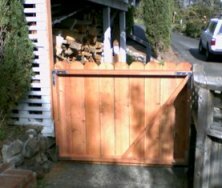 Put up a gate 5′ 2 inches wide and 6′ tall, used pressure treated wood and posts. Took out nails from old wood surrounding the hot tube and bundled 3 piles. Took old gate to be yard to be disposed. What would be a fair price. Materials cost $206. In Alexandria, Va. An homeowner thinks a 3′-6″ wooden gate hung on a 9 feet slat wooden fence, all at 6′ tall fence for just $450 is fair. They also want the chain link fence removal and disposal thrown in; someone could expect great quality and service. I’m building a 4′ wide, 6′ tall gate, setting two posts, and installing gate between house and she’d. What should I charge? 4 ft gate and 9 ft of fencing . Cost for repalce hardware and rehang picket gate cost???? A lady wants her wooden gate removed and a new one built in its place. It is 4’4″ x 6’5″. She is providing all the materials, so my quote is labor only. I’m quoting $170 for the labor to build the new door, $12 to remove the old gate, and $22 to install the new gate. My quote on the described Gate. To build and Install would be. Removal would add another $35. Unless it was a regular customer,then id do the removal for free.